This hotel features spacious rooms with free Wi-Fi and serves a daily buffet breakfast. It is a 4-minute drive from downtown Brownwood, Texas and Howard Payne University. A microwave, refrigerator and coffee maker are standard in every room at the Hampton Inn Brownwood. All rooms include a cable TV and are warmly decorated with carpeted floors. 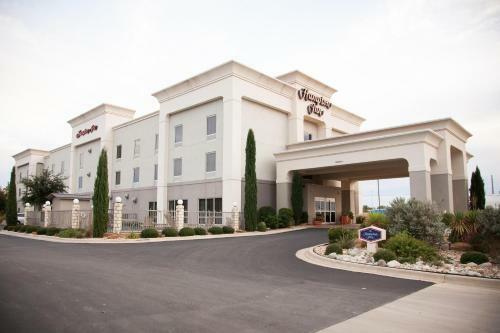 Guests of the Brownwood Hampton Inn can enjoy free access to the seasonal outdoor pool and a small gym. A business center and free parking are also available. Riverside Park and Brown County History Museum are both less than 1 mile from the hotel. the hotel Hampton Inn Brownwood so we can give you detailed rates for the rooms in the desired period.